The tragic death of Diana, Princess of Wales in a tunnel in Paris on August 31st, 1997 brought about a down-to-earth and yet profound change in British constitutional monarchy. Diana phenomenon became a symbolic space for public debate that touched on British identity and the role of the monarchy. Following her divorce from Prince Charles on August 28th 1996, a year before her death, Diana ceased to be part of the British royal family household. The event should have resulted in a loss of public attention. It did not, but instead turned into public sympathy. Her tragic death brought a spontaneous public outburst of grief perceived to resemble a demonstration to the established class. Tony Blair, the then new media-aware Labour Prime Minister, seek the Queen to appease the public to set aside the dictates of protocol and honour Diana with a royal ceremony she is no more entitled to. Ten years after her death, public attention on Diana still has not waned. More so with the latest inquest by the British court revealed Dodi had bought her an engagement ring. If the verdict return concludes the long lingering suspect of premeditated murder, a civil legal action is possibly to come from Mohamed Al-Fayed, chairman of Harrod and father of Dodi, Diana's Egyptian boyfriend. Like celebrities Marilyn Monroe and James Dean, whose life interrupted at such an early age, Diana will be permanently imbedded in memory for her fresh image of youth and beauty. Diana was born into aristocracy, youngest to the 8th Earl of Spencer with royal Stuart ancestry, whose lineage goes back to King Charles II and King James II of England. She did poorly in academics, twice failed her O Level and was sent to a Swiss finishing school at 16 for a year. Without any formal education, she made a move to London but end up jumping from cooking school to temporary jobs at a ballet academy and filled time as cleaner and cocktail waitress. Just prior to attracting the attention of the heir to the throne of England, she was part-timing as aid at a nursery school and baby sitting. Penny Junor, who wrote her biography after the dubbed fairytale wedding in 1981, provided a glimpse into her psyche. In boarding school, Diana was a compulsive washer and had a sense for drama and attention. She loved popular culture and romance novels and that developed her "common touch," to later serve her well to talk to ordinary people about things they cared about. Since childhood, she had to deal with a broken family marked by divorce, infidelities and disappointments. Her mother lost custody of her children because the court saw fit to punish her for adultery. Her father chose to marry a woman his children detested. Diana yearned for a happy family and she risked all when prince charming pursued and presented her the opportunity. In one of her charity function, she was quoted to say, “The worst illness of our times, is that so many people have to suffer from not ever be loved.” On hindsight, it’s her inner feelings and wants expressed. Diana had a sincere commitment to charity beyond the call of duty and it’s an area closely associated with her. 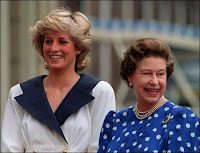 Soon after her marriage, from the mid- to late 80s, Diana began to assume patronage of various charitable organisations. While this stemmed naturally from her role as Princess of Wales, where she was expected to engage in hospital visitations and comforting the sick, she had a profound interest in certain illnesses and health-related matters. Her involvement in charity comes about more out of her humanitarian sensitivity than for any political reasons. As revealed in the eulogy by The Earl of Spencer, “it was her innermost feelings of suffering that made it possible for her to connect with her constituency of the rejected”. Diana presented a different quality in the theme of being charitable - more warmth, sincere and profound. She does not hesitate to touch and hug AIDS patience live on TV to help dispel prejudice and misconception of AIDS, to visit landmine sites in remote areas of Africa and Bosnia, and out of the sight of photographer, find her way under bridges in winter nights to view the plight of the homeless. Mother Theresa, which died two days before her own death, had much respect for and maintained close contact with Diana. Many believed that Diana is a temporary phenomenon and not permanent change in public psyche. People tend to want to see somebody worth seeing. Her beauty – physical, fine attributes and good manners – attracted such attention and built into fond affection. Diana represented a 20th Century phenomenon of stardom. While the media played a role of bringing her life into people’s homes, Diana’s celebrity status transcends the usual association of celebrity with a certain ability or achievement. To her admirers, the Princess of Wales was a role model — after her death, there were those calling for her nomination to sainthood. But to her detractors, and their conclusion do went overboard, they claim her as suffering from mental illness, delusional, and exhibit skin deep stardom. Diana was accused as saboteur of the monarchy. Beyond the glitz and overindulgence of the media, Diana’s qualities are undeniably genuine. Though born into noble aristocracy and glamorous celebrity image, her close proximity with the suffering of the common people and her own imperfections and revelations made Diana acceptable as one of us to the “common people”. Her imperfect virtues endeared her with the British public as a more realistic representation of the royals; human with its own frailty. There are those who believe that the emotional display of her death is but a manifestation of ourselves. Diana’s life mirror the pain and dream of the common folks – her hopes for happiness during courtship and marriage, her disillusionment and shattered dreams from divorce, her yearning and struggle to put her life together, and the sad ending to her new romance. Diana was a symbol of sacrifice. Firstly, as patron of victims, the sick, the discriminated against, the homeless and herself as the family love deprived. Secondly, it was partly her real suffering in the rigid royal household and partly her shrewd manipulation of the press, which finally made victim of her. The royal family then initially had their reasons to dislike her for being headstrong, insufficiently discreet, and enviably popular with the press and the public. It’s unfathomable to them of her refusal to the kind of life offered. For it was beyond them to perceive the need to transform themselves. Eventually, Diana’s death awakened the royal family to realise the public shift in values. 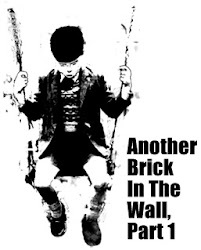 The new modern undeferential Britain showed itself capable of feeling and compassion and ready for emotional expression too long kept bottled up. Such gestures are sacrilegious in the Victorian idea for order in hierarchy, authority and masculinity that is associated with the reserve, stoic and stiff upper lip British composure. The royal family was caught unaware that Diana’s presence in the royal household coincide with a Britain transforming to be more cosmopolitan city living that is at ease with different societies and settings, and receptive to different sexual orientation or ethnic background. Britain has over the years grown to embrace the open emotionalism of southern Europeans and Americans, and expressiveness advocated by popular psychology guru. Despite unaccustomed to having her decisions questioned, the Queen eventually learned to see the rationale in the different approach. She learned to shed her indifference to acknowledge the delicate line between public disdain that could lead to their total irreverence, and allowing its subjects their dignity. Before Diana’s death, the perception of the Windsors was that of removed, out of touch, not genuine, insensitive, and poorly advised. It was this timely realisation that their past and future existence is dependent on the public's acceptance that brought about the change in attitude. The Press did stretch itself to infer the existence of a demonstration against the royal family and claim the monarchy as under threat. It’s unfair to demand the Queen to adapt and become more like Diana’s common touch and vulnerability, lest the monarchy will crumble. The royal family's attitude actually did became more Diana-like - more open, more engaged, more accessible, and more systematic in their contact with the public. The Malaysian constitutional monarchy having adopted from British tradition has much resemblance in practise. Constitutional monarchy separates out the ceremonial and official duties of the head of state from party politics, although of late is being dominated by politicians. This represents and provides stability, continuity and a national focus. Since independence and with the consent of the royal, the sovereign acts as head of state, and legislative power and selection of executive resides with an elected parliament, with judiciary as another independent branch of Government. The sovereign governs according to the constitutional power accorded with the basic rights to be consulted, to encourage, and to warn. This is supposedly done officially on the Wednesday consultation and briefing between the prime minister and sovereign, prior to Cabinet meeting. Over the course of their reign, a sovereign has all the opportunity to accumulate far more knowledge and experience in the working of government and nation than any Minister to make their consultative role more relevant. In one of his lecture this year, YM Raja Nazrin, the crown prince of Perak, stated, "The Federal Constitution mandates the monarchy to be the guardian of the just rule of law, an impartial arbiter in the democratic process and an overseer over the pillars of state.” This burden of responsibility on the sovereign requires a dedication and attention to be in the know, in touch and in confidence with Government and people and constitutionally above politics. In addition, the monarchy has official roles in the armed forces and police. The civil service carries out their role under the command “Urusan Seri Paduka Baginda” and that explains the use of “kerajaan” to signify Government. In certain former unfederated Malay States, the state civil service comes under the direct purview of the sovereign. 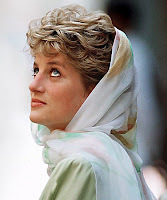 Diana experience perhaps has its relevance to the Malaysian constitutional monarchy. If the stoic British royal family could transform in line with social change, the same should be anticipated by their Malaysian counterpart. To a limited extent, Malaysia itself is undergoing transformation into its own modern cosmopolitan character and some common social change could only be expected. The modern practise of monarchy needs to be realistic and relevant with the time. No more the perpetuating the myth of monarchy as divine, removed from public exposure and access, and commands blind loyalty. It is this notion in the not too distant feudal history that resulted in rampant episodes of neglect, indulgence, and abuse on the nation and people and left an indelible mark on the people’s psyche and mindset. Through it, the subjects remain loyal to the monarchy. It’s timely that the monarch redeems this past to deploy public respect and affection to bring about national morality, dignity and unity. The monarch could take a leaf from the Diana episode to be more open, engaged, and accessible to endear themselves with the common people that are increasingly more indifferent with the institution. Their active role in public and voluntary service should be the opportunity to break the barriers for a direct touch with the subjects and civil servants to listen more, embrace more and involve more. This is Diana in her own intuitive, articulate, and observant ways indirectly extending herself for Malaysia. Indeed, she is a serious thinking woman beyond the biography of herself portrayed her to be. Takbir kedengaran mendayu-dayu melaungkan kebesaran tuhan menandakan kemenangan menakluki nafsu dan meningkatkan keinsafan diri kita sebgaai makhlut tuhan yang kerdil. Allah yang maha besar! Allah yang maha besar! Allah yang maha besar! Setelah sebulan Muslim mengerjakan tuntutan Rukun Islam berpuasa di bulan Ramadhan, Eidul Fitri melambang kejayaan ini. Muga apa yang dicapai dan perjuangan yang dilalui di bulan Ramadhan membawa keinsafan dan kesedaran hingga menjadi amalan yang berpanjangan sepanjang hayat. Tahniah! Selamat Meraikan Eidul Fitri. Blood Bank Critically Low - Jom Donate! Blood level at the National Blood Bank is at a critical low level. 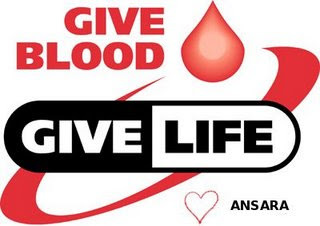 ANSARA at the request of the National Blood Bank is organising a blood donation campaign on Monday October 8th, 2007 7:30 p.m. (after Maghrib prayers) at the Masjid Kampung Baru. For more info, read BigDogDotCom. To quote Big Dog, "Preservation of life, regardless race, religion or creed, is the current flavour of the week in local medias, especially after Tee Hui Yee’s heart and lung transplant which managed to garner so much attention from all walks of life amongst Malaysians." Everyone, regardless of race, religion or creed are welcome. Jom Donate! Malaysia Today provided a linked to You Tube video of a CBS 60 Minutes documentary revealing the Bush administration's intention for a planned takeover of Iraq from Day One. Within a short span of time after the 9-11 incident, President W Bush made a quick referal to Muslim fundamentalist terrorist and point blame on Afghanistan's Al-Qaeda and Iraq's Saddam Hussin WMD. When conspiracy theories of 9-11 first surfaced in 2002, many dismissed it as outlandish for a Government to attack its own city and kill some 3,000 of its won citizen. As time past, more and more revelations are coming out to show that 9-11 is a pre-planned "Pearl Harbour" to justify the new President's hawkish policies. In case you missed or not convinced of Michael Moore's socio-economic conspiracy of the event in his documentary, Farenheit 9-11 (trailer here), this video revelation is put togather to present the conspiracy behind 9-11. Last year, many revelation began to emerge to support the theory that 9-11 was an organised building demolition. Lets start with this video testimony of a fireman account. Dutch demolition expert, Danny Jowenko believe it is a planned demolition. FEMA, a professional structural engineering association, was first within a year to be curious for the collapse of the WTC, citing the structure could not melt and cause the collapse. MIT Engineer and Scientist, Jeff King has this to say. There was a clear coverup attempt by the 9-11 Commission. This 1945 song sang by Judy Garland in the movie Ziegfeld Follies had a wonderful lyrics at the end. "If my son was buried with his organs, he will not be able to contribute to others. This is his last contribution", said the father of a 15 year old boy who died at the Ipoh Hospital from a traffic accident. His heart was donated and transplanted to 14-year old mechanical heart girl Tee Hui Yi at the Kuala Lumpur IJN on Wednesday. Tee Hui Yi had to undergo a second heart transplant early Friday morning today, after her body rejected the one from the 15 year old Setiawan boy. The second heart came from a 39-year old man suffering from idiopathic pulmonary fibrosis (lung failure). She is still in critical condition. Give a heart and pray for her recovery. 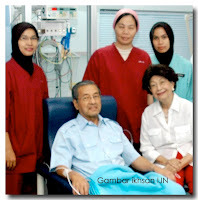 While all this going-ons at IJN, the founder himself, Tun Dr Mahathir is recovering well after his "second by-pass" operation to clear infection within weeks after an earlier second by-pass operation. By doing it here in Malaysia, he is acknowledging the ability of Malaysians in the field of medicine. It takes courage to undergo an operation at the late age of 82. Courage is usually driven by a purpose. For the latest and most reliable information on his condition, read RantingsByMM and IJN Press Release, usually reproduced by BigDogDotCom. So, don't listen to rumours! Although no prayers were offered by the UMNO Head Office, Tun received massive outpouring of well wishers and prayers from appreciative people here and abroad. Source told recently, the Masjid Nabawi in Medina made a special prayers for our beloved Tun. Even when Tun Ghaffar died last year, UMNO organised no special prayers for him. I was glad to attend one by a group with a heart. Yet, a much different reception was given for the late Dato Kailan and Datin Seri Hendon. Is this how UMNO appreciate their past leaders? From one heart the concern of many and those many with no heart, Tan Sri Syed Mokhtar was all hearts. Al Bukhary Foundation had its RM2.2 million Albukhary Dialysis Centre at Alor Setar launched yesterday by Dato Najib. The centre offers free treatment to the poor irrespective of race or religion. Health Minister Datuk Seri Chua Soi Lek, who was present at the ceremony, was reported by The Star about kidney patient situation in the country. There are 14,000 kidney patients in the country and 2,500 undergoing dialysis treatment. The number of kidney patients is expected to increase to 20,000 by 2010. It's the willingness to share God's gift with others that remove ill thoughts and envy towards the rich. With a heart like yours, may you continue to prosper and grow, Tan Sri. The much hurrah over our Malaysian astronauts being mere tourist is just out of pure envy. Flight participants means our Malaysian astronauts or considered by the Russians as fellow cosmonaut are up there as researcher and not mere passenger. The Russian described such talk as logical myopia. Remember in Malaysia, when someone used to say why seek for independence when we can't even produce needles to sew. One time ago, there are those that felt Malaysian shouldn't dream of producing their own cars. This is our first trip up and its not our space craft. Before we run, shouldn't we learn to walk. Do Malaysia proud, Dr Sheikh Muszaphar. From the perception of acting to actually acting, Dato Tony Fernandez, CEO of Airasia made his first debut as an actor in a cameo appearance in local film production, Cuci. It so happen the film is produced by Fernandes Tune Entertainment Group Sdn Bhd and Hans Tall Order Productions. Now, he already adopted the red colour scheme and casual style of Virgin Air for Air Asia. Although this is not his first attempt to acting, having potrayed himself as a successful Airline CEO for many years, it will be part of his transformation into a Sir Richard Branson clone. He was, like Branson, from the music industry. Perhasp in a matter of time, he will emulate Branson's stunts like having dinner on top of a floating hot air balloon. Who are thou shareholder of Tune Air Sdn Bhd? Another variant acting possibility is Tan Sri Mahyuddin. The Agricultural Park in Bukit Cerakah is to be turned into the world's biggest botanical park, National Botanical Garden Shah Alam. It'll take up the size of 817 ha. Cabinet has approved a budget of RM114 million. It is expected to be completed by the 10th Malaysia Plan. Did I here 10th Malaysia Plan? Yes. These days, everything needs not only long but very long term treatment. The economic corridors spending plans are for 20 years. In 2005, our 5-year Indusrial Master Plan was changed to a 115 year 2005-2020 IMP. Even 2020 Vision has changed into 2057 National Mission. Such far sighted visionary and anticipative leadership. Far enough to forget that the 800 ha park has lost its biodiversity of flora, fauna and wild animal population built over 20 years since 1986. All to the greed of property developers and their fascination with natural cement and concretes. 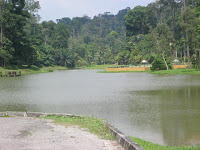 In June 2005, 118.7 ha of the permanent forest reserve was de-gazetted and 30.4 ha was given to PNSB for mixed development. A case of trying to act as though nothing happened. But Tan Sri is not to be blame. He is merely solving a problem from the 2005 expose. The launching is in accordance with the plan. Do Right, Not Just Do Justice! At the end of the legal drama film, The Winslow Boy, there was a profound dialogue about justice. Sir Robert: ... I wept today because right had been done. Sir Robert: No. Not justice. Right. It is easy to do justice -- very hard to do right. The words of Sir Robert appropriately described the reality in the pursuit of justice. Hereon, justice will be written with open and close inverted comma. "Justice” is merely by-product or incidental from winning cases. In plain language, winning court cases does not necessarily assure “justice” is served. One lawyer’s inability to see a certain aspect of law results in an expensive loss to his or her client and justice is denied with ease. It's this similar reality that perhaps brought about a cynical remark from Clarence Darrow, an early American civil libertarians, “There is no such thing as justice - in or out of court.” His winning streak against death penalty substantiates the point that he won out of his litigation ability. Was justice served? 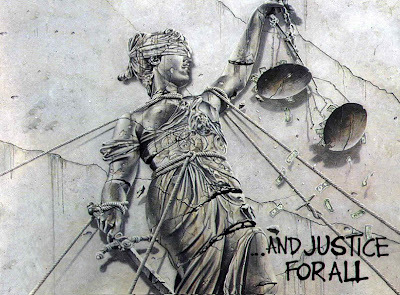 One tongue and cheek description of "justice" claims it as the law and the law is men’s feeble attempt to lay down the principles of decency. Judges and lawyers as practitioners of law are attempting nothing more than a feeble attempt to be decent. Perhaps the television tend to over-romanticised lawyers. LA Law TV series presented lawyers with glitz and glamour. In Law & Order TV Series, prosecutor McCoy is depicted as a man of ideal, persevering in the pursuit of “justice”. Lawyers potray themselves as champion of individual rights, defender of the Constitution, guardian of the oppressed, and advocate for clients’ principles. Let's snap out of this perception and back to reality. At the practical level, most lawyers are not persons who know the law, but learned in finding the law that fits a given situation and the right angle to read it. Many, if not majority, are mouthpieces for their clients to speak in the foreign language of law. The ultimate sarcasm against lawyers is as hired guns sold to the highest bidder. If that is the condition in the US, frankly ours does not fare any better or even worse. My lawyer did not turn up in court and I end up spending money for appeals. My friend’s wife’s lawyer came to an Industrial Court hearing unprepared. The story of lawyers absconding clients’ money is widespread. Lawyers refuse clients in order to safeguard their Banking clients’ account. With every other lawyer having Banking clients, what hope is justice served for victims of powerful Bankers? This reminded me of the saga of Dato Idris Tulis and Bank Bumiputera. Back in mid 80s, one is reminded of a practicing lawyer making a RM16 million remittance steal from Bank Negara. In the early days of this nation, lawyers are positioned at every other post in Government, Corporations and Politics. But, the country only made its quantum leap under the decisiveness and surgical precision of a doctor. Beyond the realm of law, there are those that feel the legal profession is over-rated. Its difficult to do right, but easier to shout. Nevertheless, last Thursday’s march by the Bar Council and lawyers at the Putrajaya deserve every shout for it demonstrate the right of people to an assembly esssential in a democratic process. The dismissal and denial of citizens’ right to gather and demonstrate with manipulative use of media and administrative limitation as excuses is unconstitutional. The march should be supported not to give high regards for the Bar Council. The Bar Council has not met expectations to upgrade its professionalism in the profession, improve practices & procedure, discipline its errant members, and give much consideration to the legal consumers. Its own house is yet but in order and AGMs is infamous for quorum deficient. Sadly, the march itself is not representative of all Malaysian lawyers. Is there unclear and disunity in purpose? Lets hope the march does not represent certain interest groups. The march should be supported for it should be symbolically interpreted as the people giving the system of “justice” the high esteem it deserve as a branch of government. All citizens, who believe in the need for a fair system of “justice”, to compliment the role of Parliament, and executive as branches of Government in our system of Constitutional Monarchy, should support any effort to do so. The wrong done by other branches of Government could be corrected by a system of “justice”. For it pains, to see properties and assets of the common people acquired for the interest of faceless corporations. With ECER and NCER to come on stream, can the right of the Malay Reserve land owners safeguarded from the interest of the Might? “Justice” should not be exclusive to judges, lawyers and intellectuals but to all Malaysian. This fight for “justice” should be free from unstated personal interest or for the benefit of any related genus. It certainly should not be hijacked for the interest of certain quarters of the legal fraternity. Nor should it be merely to serve the interest of minority interest and fringe groups at the expense of the right of the majority. The fight for "justice" should not be padded with ulterior purpose to sway decisions in any way. Right should remain permanent. The fight for "justice" in the practise of religious freedom should not be at the expense of the right of Muslim majority, its institutions and aspirations. The rights of individual should not supercede the right of many, nor should the converse. Let's just see right is done. For that, lets not be lost in verbiages of slogan in this pursuit for the better. There is no need for anything new. Too much meaningless slogan for new has been let allowed - Melayu Baru and New Labor, to think of a few. Reform is just a dramatic slogan for new. Paradigm shift is seeking for something new out of the box, which seldom is. Do not allow the discontinuation and uprooting of our history and tradition. For there, lies the closest to right. Beware! For every revolution, there lay deep hidden hands providing money in exchange for principal and interest. If right could be achieved by something new, do so within the perimeters of evolution. Reform as slogan could be tolerable as long as right is done. Paradigm shift is fine if it could achieve more moves towards right. Perhaps, a paradigm shift for a Malaysian Law based on the spirit of the Rukunegara. Perhaps, a law that is clear on right and wrong which is embedded ethics and morality inherited to us by our cultural tradition, religion and history. As time passes, the norms change together. Nothing should instill fear in us more than the morality of our forefathers compromised by time and changing norms. When gay and lesbian union and unmarried live in become common, will that be the basis of our law, supposedly written words of decency? Decency and courtesy within our culture and psyche should be of paramount consideration in our pursuit for that elusive "justice". Wild accusation is wrong and ascribing guilt on those other than the responsible ones should be stopped. Until proven guilty, everyone is innocent. Being bold and righteous, does not mean compromise of ones courtesy and respect for others. In the Court of Men, the Constitution is supreme but it should be taken as whole and not selective. The spirit in an article of law should be upheld together with the withstanding exceptions. Deep embedded within our constitution lies treaties, agreement and contracts that binds our past to the future. Its the continuity of our tradition as a free nation. And, its our solemn duty as Malaysians to uphold.